Bomb, knife and vandalism marred otherwise peaceful Tomb of Machpela. After a quiet month of Ramadan, vandalism, a knife and a bomb were discovered at the site. No injuries were reported. On Monday, June 11, 2018 an improvised explosive device made of two small gas canisters was found planted at an entrance to the Tomb of the Patriarchs. The site was closed for approximately one hour while sappers neutralized the device. The police issued a statement which read: "There is a unique coexistence in the area of the Tomb of Machpela that includes security forces and border police. Their goal is to allowing freedom of worship to both Jews and Muslims. We will continue to work with determination and professionalism to protect the security of all citizens, residents and visitors to the site." A day before, on Sunday, it was discovered that portions of the Jewish side of the Tomb of Machpela were vandalized during the final Friday of the month. One of the large stone flower displays was broken, as shown in the above photo. There was an attempted break-in of the locked book case containing Jewish books inside the complex. In past years, the mezuzah from the Jewish entrance was stolen. The mezuzah had been dedicate din memory of a victim of Arab terrorism. Also, in 2016, A storage shed used by the Tombs maintenance staff was also broken into, with thousands of shekels worth of equipment stolen. On Monday night, border police arrested a PA resident who attempted to enter the Cave of the Patriarchs concealing a knife. The Jerusalem Post reported that the Hebron area man was asked by police to remove his coat, at which point the knife fell to the ground. The man was taken in for further questioning. The 2,000-year-old Machpela structure houses the underground burial caves of the Biblical Matriarchs and Patriarchs. Local Muslims call the site the Ibrahimi Mosque, using the Arabic name for Abraham. There are ten days of the year for exclusive Muslim prayer services and ten days for Jewish services, corresponding to each religion's holidays. During Muslim holidays, Jewish services are held outside at the Seventh Step garden. Israeli and PA security and medical teams work together to ensure safe access for the crowds. Despite the well-publicized tension between Jews and Muslims in the city, officials from both sides work together during large scale events. For the most part, there are no incidents. Likewise in Jerusalem, thousands of Muslim from around the region prayed at the Temple Mount throughout the month of Ramadan without any serious altercations. According to the Times of Israel, on the first day of Ramadan, "some 40,000 West Bank Muslims came into the city to pray alongside East Jerusalemites. Some 8,000 Palestinians gathered to pray at the Tomb of the Patriarchs in Hebron." Ynet News reported a relative calm, describing Israeli soldiers greeting Muslims worshipers as they left the metropolis of the PA side of Hebron to venture into the mixed Jewish-Arab section of the Israeli controlled Old City where the Tomb of located. "The Palestinians arrive for the prayer dressed in their finest clothes, some wearing elegant white galabiyas and others—especially the children and the youth—wearing a white flat cap with the caption, 'Praying at the Cave of the Patriarchs on Ramadan.' A large blue sign, prepared by the Judea Territorial Brigade, welcomes the worshippers at the entrance to the cave with the 'Ramadan Kareem' greeting... Within less than an hour, as many as 5,700 Palestinians gather in the adjacent Cave of the Patriarchs, crowded in the halls of the Jewish part of the cave as well, which is fully allocated to Muslims on the Fridays of the main Muslim holiday. As the prayer reaches its climax, Border Police forces close the entrance—not for security reasons, but simply because it is packed to the brim. The prayer continues in perfect silence, and crowds of other people prostrate themselves, despite the scorching heat, in the compound’s yards and on the stone path leading to the cave." During normal days, the Cave of the Patriarchs is divided into Jewish and Muslim sections, with the large Hall of Isaac being the designated as the Muslim portion. During respective holidays, each group removes religious items such as books, carpets and signage and returns them after the holiday is over. Hebron is the largest and most industrialized city in the PA. The Arab side of the city has been celebrating the month-long holiday with special events for children in Ibn Hussein stadium and by lighting up the main square. #إعلان_لأهالي_الخليل انتظروا أكبر مدينة ألعاب متنقلة في استاد الحسين بن علي الدولي في الخليل ، إبتداءً من تاريخ 13.6.2018 حتى ثالث أيام العيد. All in all, this year's Ramadan has been peaceful in comparison. 13-year-old Hallel Yaffa Ariel was murdered by an Arab terrorist in her bed during Ramadan of 2016. Strings of terrorist attacks have marred Ramadan in the past. The next Muslim holiday will be the final night of Ramadan, Eid Al Fitr on Thursday, June 14, 2018. The next Jewish holiday in which the Tomb of Machpela will be open in its entirety to Jews will be Erev Rosh Chodesh Elul, celebrated early, on Thursday, August 9, 2018. For full list of openings and closings click here. During the Muslim holiday of Eid al-Fitr, more vandalism was discovered. 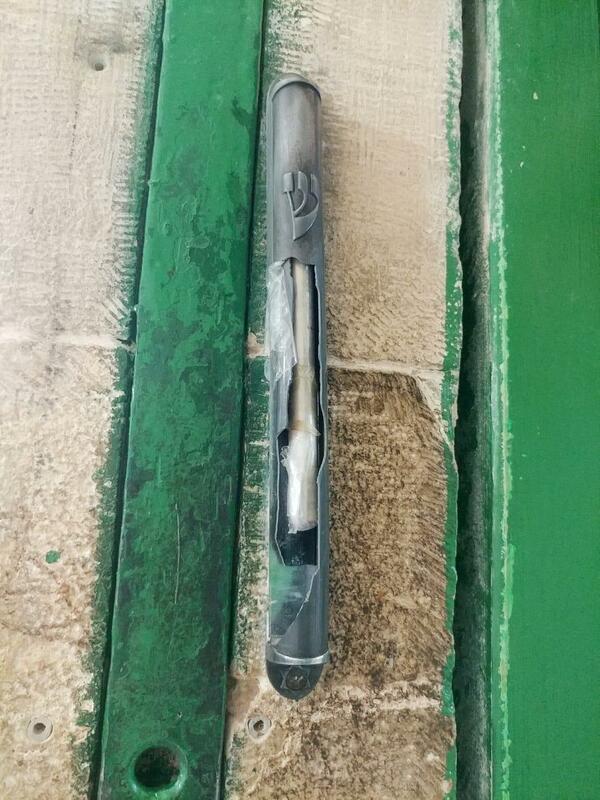 A mezuzah was smashed in the section usually used for bar mitzvah ceremonies.